Previously I was training and trying to surf large waves. I had the gear and connections. Being an El Niño winter here in CA,SD it was perfect to start riding big waves as I have been surfing from awhile now. Then blam, got in a car accident and rear ended at a stop. Messed up my shoulder pretty bad. I could no longer crank it back to paddle for hours at a time. Dream died quick. MRIs, rehab, chiropractic care. All determined that it might never be the same. I felt at a lost until I decided to make the leap and buy my first bike, something I've been wanting for years. This bike has given me a new passion that far exceeded any expectations I had. The void created by the accident was easily filled. I bought my fz-07 completely stock. I've never ridden anything or even touched a bike before. In a matter of a month I got licensed, began the never finished journey of learning to ride better everyday, and modified my bike. I did all the work myself and I just had to say thank you to all my brothers in the forum. I couldn't have done it without this group. So thank you all. Mods: Full titanium ak exhaust no DB. Dna air filter and air box cover. Arrow bar end mirrors. R6 throttle tubes and grips. Crg levers. Air "intake" and "Exhaust" screens. Yoshi fender eliminator. MotoD integrated tail light. R6 flush mount front signals. Custom led relay. Power commanderV with map for AK and DNA. Cyclops led headlight and led light under it. Radiator guard. Did oil changes and chain clean and lube. 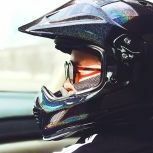 Did is all this with no prior bike experience and knowledge with you help. It's greatly appreciated. I love every second of riding an take it slow as I know I'm obviously learning. Not that it ever stops. 2000 miles down and many many more to go. Be safe out there. Good on ya zero... bike looks great! The bike came along at a time in my life where I needed it too. tried to get a Yamaha Warrior back in 2001 ish could not get financed 15 years later I picked up the FZ and love every min I'm on it. Welcome! Sorry to hear about the accident. I grew up in SD and did quite a bit of surfing in my youth there. Hopefully everything works out. We're glad to have you here! Great to see you here @zero. Thanks for joining. Love that color ! Welcome to the forums. Bike is looking fresh. And hey, don't give up on the shoulder. (not that I'm saying you planned to) Willpower and determination will make a square peg fit into a round hole. At least your in the motorcycle mecca of the U.S. so you picked a fine sport as a substitution. Sorry about your misfortune but I'm glad to see you've found a new joy. I'm curious about the LED you put under your headlight, can you put up a few pics of it, daytime and night to show it's effect as well? 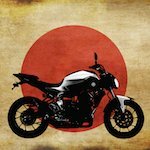 Welcome to the forum and the world of the FZ-07! I love San Diego. It would be my [HASH]1 choice for a place to move to (if CA wasn't having so much of a problem with fresh water, that is). I'm working on trying to get back out for a visit next year. Thanks for all of the greetings. They're appreciate for sure. I havent made made it home in time from work,for,a daytime one this weekend I'll make it happen though. 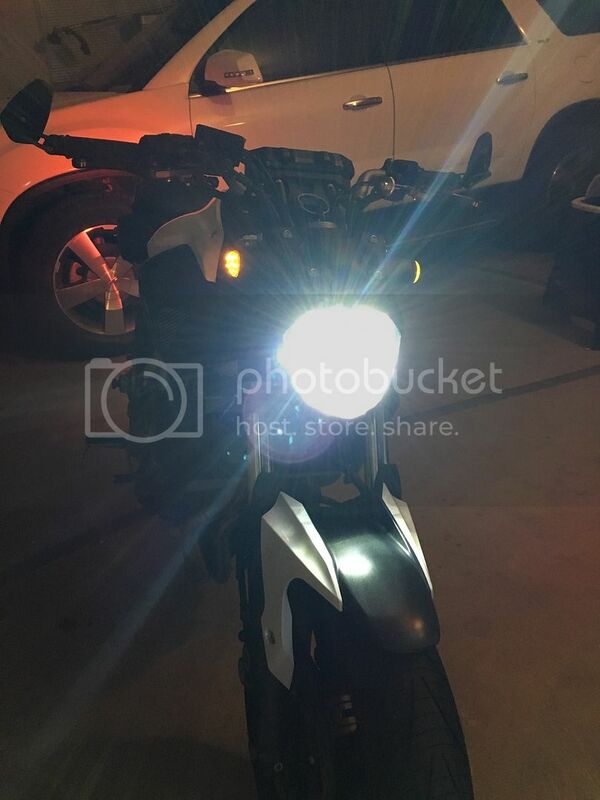 Looks nice, I didn't realize you were talking about the little park light, I took for you mounted a new LED under your headlight but it's so much brighter than the stock blub. I cn't stand that yellow light on a vehicle. Where did you get it (part #?) or can you get those in any parts store? Welcome! Great color choice! There's a couple on the forum from SD. Check out the group rides if you're interested. Once it warms up again, that is. Tell me about it. I just had to get a bunch of cold weather gear. Riding through alpine when it's 30°-50° got wayyy to cold for what I had. That's for sure. I also have some friend that ride. I'm just getting more comfortable with staying in a line and what not. But when I am I'm definitely in on group rides. Just want to make sure I'm ready to be around and near other bikers on long rides. 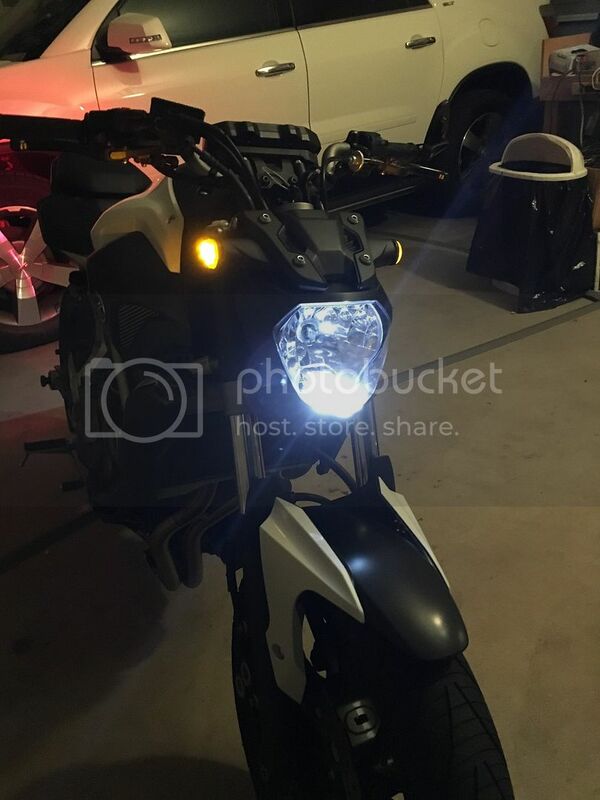 zero Looks nice, I didn't realize you were talking about the little park light, I took for you mounted a new LED under your headlight but it's so much brighter than the stock blub. I cn't stand that yellow light on a vehicle. Where did you get it (part #?) or can you get those in any parts store? Oh man. That's been on my mind. Putting an led beam mounted on the front fender for distance. The cyclops led did change the game quite a bit though. But a little more distance would be nice. Here is the light I bought. Read about it on here. It looks clean and just adds to the lumens/being seen. I like the fork mounted bullets with modulator to get even more attention. Yes! Denali was the brand I was looking at. I'll pay that all day for the distance. Well worth the visibility. Thanks for the suggestion man. If I end up doing it I'll send a picture. I think I will. HAHA Wtf? "get all canadian" ?!?! Are we known to overly "disco" up our bikes up here? Good sir, a gentleman's duel just might be in order. welcome, love it, where it cali! I have absolutely nothing against Canadians, Canadians are cool. "Get all Canadian" was a reference to a pic in another thread so you misunderstood it's meaning. Down here in San Diego!